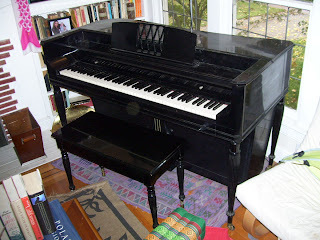 This piano used to belong to my customer’s aunt, who was a New York socialite. Leonard Bernstein gave it to her. It is a spinet, but the case makes it look like a tiny grand, even down to having three legs instead of four. It’s a one-of-a-kind piano, with design touches I’ve never seen anywhere else.